The Ryobi string trimmer is designed for one market in mind - the homeowner. Since small engines can be notoriously hard to start, Ryobi features a built-in battery powered electric start. The battery is recharged using a wall outlet. Of course, no professional lawn maintenance man ( or woman) would be caught dead with an electric start trimmer, but hey! This was designed for the homeowner, right? The solitary model offered by Ryobi features a 3 year homeowner warranty. 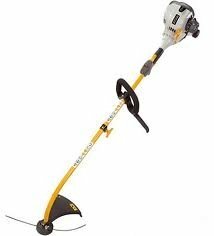 Model RY28020 is a basic homeowner curved shaft trimmer, with a low emission 2 stroke engine. The eye-catching Ryobi colors and styling come standard. The ZipStart carburetor helps to start the engine with fewer pulls ( so much for the much-touted ‘string trimmer workout’ popular in so many suburbs!) This weighs in at 10.8 lbs, and has both the “ReelEasy” refillable line line head,as well as a fixed line adapter. The price is usually about $100.00 at your local big box store. Model RY28040 has the identical engine as the model RY 28020, but has a straight shaft instead of the curved. This drives the weight up a bit ( to 11.8 lbs). The price is a little higher, also. Count on spending about $124.00 for this weekend warrior. Maybe you are the type of person that demands a 4 stroke engine on his or her trimmer. The thought of mixing oil with the gas is just too much to bear! (and too messy). Model RY29550 could be the machine for you. A flex shaft trimmer that supports attachments, the engine is a ( relatively) powerful 4 stroke, that is simple to use. Just add gasoline, turn on the switch, and pull the rope until the engine roars to life! The cutting head has the same 2 options as the other Ryobi models. The weight is a surprising 10.65 lbs, which is not bad for a 4 stroke trimmer. The Ryobi Model RY29550 has the “Touchstart” electric start feature, which cranks the low emission 30cc 2 cycle engine. A standard pull rope starter is included, just in need a back up plan is needed to start the engine. The shaft is straight. Attachments work well with this trimmer, also. The cutting head is the industry standard 2 line bump feed head. The price for this innovative homeowner machine is $160.00. Take a look in your favorite ‘Big Box” store for this king of this back yard suburbs.